1 ton is a unit of weight in the U.S. customary system that is equal to 2000 pounds. 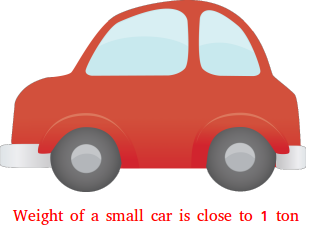 The weight of a small car is about 1 ton or 2000 pounds. For example, the weight of the 2015 Mitsubishi Mirage is very close 1 ton. According to some sources, the weight is 1973 to 2051 pounds. Suppose the weight of 1 book is 1 pound, then the weight of 2000 books is 2000 pounds. Therefore, 1 ton is approximately the weight of 2000 books. Suppose the weight of 1 man is 200 pounds. Then, 10 men weighing the same as the 200-pound man will weigh together 1 ton. The ton used in the USA is also called short ton.